Discover and Cultivate Your Leadership Potential in Austin, Texas! The Austin Regional Cohort provides you with education and resources to demystify the myths around running for office, a judgment-free zone where women can explore a future run for office without intimidation, and a local community of supportive women. Now accepting applications for our Austin Regional Cohort! She Should Run is a nonpartisan nonprofit promoting leadership and encouraging women from all walks of life to run for office. We are driven by a vision of seeing 250,000 women run for office by 2030. The Regional Cohort is a combined virtual and in-person program led by women leaders with significant, first-hand political experience. In the Regional Cohort, women from a locality come together to cultivate their leadership, build their networks, foster their communication skills, and find their own pathway to elected office. The structure of the Regional Cohort is one virtual pre-session, one full day in-person session, and one virtual post-session. During the in-person session, Cohort members have an opportunity to network face-to-face with each other and hear from women leaders in their own community about their path to public office. After completing the Regional Cohort, each woman will walk away having discovered their “why” they want to run for office, a supportive community to encourage them on their journey, and increased confidence around taking that first step. Regional Cohort Costs: A $50 registration fee is required upon acceptance into the Regional Cohort. You are a woman who cares about her community, sees a problem, and wants to make a change. You are curious about the pursuit of political office and may be unsure about how to take that first step. You may not see yourself running in 5 or 15 years, but by the end of the Regional Cohort, you will know that it is a possibility within reach. You are excited about joining a community of women from all backgrounds and all across the political spectrum as you start your journey. Preference will be given to women who live in the area that the Regional Cohort is taking place in. *Attendance at all sessions is required to receive a certificate of completion. If these dates and times don't work for you, sign up to receive details about upcoming Cohorts. 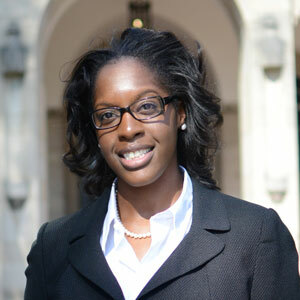 Originally from Charleston, South Carolina, China Dickerson has almost two decades of experience working in the areas of political campaigns, community development, and the federal government. China’s career includes service with the Peace Corps in El Salvador and serving as the Deputy Director of Women Ready for Hillary. Most recently, China was Senior Advisor for Dionne Reeder, who ran for DC City Council, and At Large and Campaign Manager for Lauren Underwood who recently won her race to be the youngest African American woman elected to U.S. Congress. China is also proud to be Chair of the Young Democrats of America Women's Caucus and to serve on the executive boards of Women Under Forty PAC and Men4Choice.